A scenic vertical picture taken of Swig Hall at Santa Clara University in California. 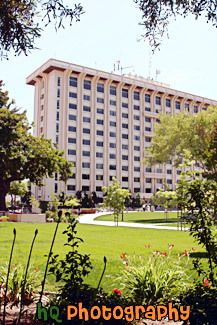 Swig Hall was built in the 1966 to provide much-needed housing to the booming student population. At the time, it was the tallest building in the city of Santa Clara at 11 stories. Today it is home to the Cypress and Delphi Residential Learning Communities. It is named for Benjamin Swig, the chairman of SCU's board of trustees during the building boom of the 1960s.